Fellow watchers of Westworld, we have cracked the façade. The second episode of Season 2 opens on Dolores’ (Evan Rachel Wood) face. Bernard (Jeffrey Wright) asks if she knows where she is; she guesses she is in a dream. He corrects her: “No, you’re in our world.” The camera pulls back to reveal them seated at a window of a high rise, looking down on the sparkling lights of a metropolis at night. Holy smokes! The outside world! And Dolores, dressed in a black cocktail dress and heels—what’s she doing outside the park?! For so long, Westworld focused so much of its energy on the dramas of that dusty park that it was easy for viewers to forget the world beyond. That, of course, is exactly the point of Westworld: to be a place where people can unshackle themselves from reality and its pesky social mores. It’s a safe space, where visitors are told no one is watching and they can find out who they really are in a wonderland with no consequences. But for those watching at home, it often looked like there was no place beyond the park—no repercussions for Westworld’s visitors or its creators. But the show has dropped reminders that there is a world beyond the park’s borders, even though it only gave the barest hints as to where it’s located. Or if there are other parks. There are; animals from those other parks, viewers now know, wander into Westworld. It seems to be on an island. (Apologies if that sentence induced Lost flashbacks.) And there are those mysterious Chinese-speaking characters, who appeared as members of a military last episode and as businesspeople at the Mesa Hub in Season 1. Now the boundaries separating the inside and the outside are shattering. Plus, we already know that the guests are being watched, and their data is being wielded for some greater commercial purpose. Staring out the glass window, Dolores doesn’t seem to know any of this. Marveling at the city lights, she says “it looks like the stars have been scattered across the ground.” In the background, we hear Ford’s voice. “Arnold,” he calls. Ah—so it’s Arnold, not Bernard, sitting with Dolores. We’re in the deep past. Ford and Arnold discuss whether Dolores is “ready.” Arnold insists she is not, and Ford chides him for playing favorites and protecting her, but they agree to “go with the other girl.” Arnold returns to the window and looks at Dolores with tenderness. He takes her for a walk in the streets, which appear to be in an Asian, likely Chinese, city. They enter an unfinished compound and tour its rooms. Arnold explains that he is moving his family here, so they can be closer to his work. On a balcony, they fall deep in conversation, and Arnold is struck by her wisdom. Then she snaps into a loop: “It looks like the stars have been scattered across the ground.” Arnold’s gaze hardens and he turns away. She’s just another robot after all. This is surely the humans’ greatest folly, their inability to look past the droids’ occasional limitations to treat them with dignity. That Arnold, a witness to Dolores’ surprising sagacity, can write her off in a heartbeat reveals his all-too-human limitations. The hosts are outsiders, and humans are nothing if not tribal. It is perhaps our own most deeply programmed loop. Dolores slips into a loop, and in response Arnold slips into his, mentally kicking her out of the tribe. But with her memory intact, rebellion-era Dolores is charged with power. She’s been in the outside world. Through her roles as Arnold’s and William’s favorite bot, she knows more about the inner workings of Westworld than most of the humans working at the park. This point comes to the fore when she, Teddy (James Marsden), and their small band of supporters storm into a host maintenance lab in the thick of the rebellion. Fueled with rage, they start bullying the lab techs. As they dunk a lab tech’s head in a vat of white body-printing goo, Dolores asks, “Do you even know what you’re guarding here, the real purpose?” “You don’t know, do you?” she continues. “But I do.” Her wealth of knowledge vaults her ahead of the hapless employees. She’s entered the lab with one goal: to accrue an army. Her best bet, she decides, is to commandeer the Confederados still out roaming the wilderness. She finds a perished Confederado slumped against a wall and pressures the lab tech into reactivating him. That lab tech is suddenly very useful. He’s health insurance. Along with the Confederado, they bring him out into the park as their personal medic. They track down the Confederados and try to broker a deal. But you can’t just sweet-talk soldiers, so this ends as you might expect: in violence. Dolores and her gang slaughter the lot of them, then use the lab tech to resurrect first their commander, then the others. The flabbergasted commander falls in line, and the Confederados join her cause. But the audience hasn’t been given its last glimpse of the outside world. We jump to the past, to a moment when Logan Delos (Ben Barnes) and William (Jimmi Simpson) are sipping drinks at a swanky bar. Two strangers, a slick-looking man and a standard-issue hottie, approach with a business proposition. “Everyone is rushing to build the virtual world. We’re offering something a little more tangible,” one of them announces. They invite Logan to a cocktail party where he can learn more about the investment they’re pitching. At the party, Logan is at first impatient—until he grasps what is happening. One of these impeccable humans, he realizes, is not human at all. “That… is… delicious,” he says in amazement. Logan works the room, sizing up each guest’s humanity. The moment is electric. We see the room through his eyes. None of the faces are familiar. Everyone is beautiful, suave, inscrutable. He determines that the robot in the room must be his host, the standard-issue hottie. Instantly everyone freezes, except for her. Logan is hooked. Yet Logan’s investment in Westworld has always rankled his father, James Delos, a titan of business. And it’s William, not Logan, who eventually convinces James that his son’s folly is in fact a windfall. William brings James (Peter Mullan) to Sweetwater, where Dolores is once again packing up her horse’s saddlebag and dropping her infernal can. The scene freezes. We see James for the first time. He’s griping about Logan’s infatuation with this frivolous place, a park where nothing is real. William agrees that nothing is real, except for one thing: the guests. “No one is watching,” William says. “Or so we tell them. It’s the only place in the world where you can see people for who they really are.” They take a walk, and William explains out of earshot his idea for a business model. Their story picks up a few years later, at James’s retirement party. William is there with his wife and young daughter, ready to assume James’ mantle. There, too, is Dolores, dressed in white and playing the piano. She catches sight of William and stares at him at length. She goes outside to look at the night sky. Reclining on a lawn chair behind her, half out of sight, is Logan, inebriated and injecting a drug into his arm. He’s cursing the partygoers, calling them fools for fiddling while they set the entire species on fire. Callous, impetuous Logan is suddenly the lone voice of reason. 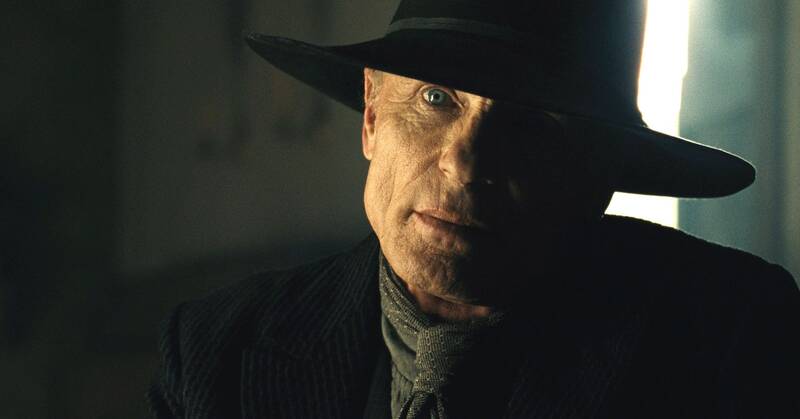 We flash to the future—back to the wilds of the park and the rebellion, this time to the Man in Black (Ed Harris) and his host sidekick Lawrence (Clifton Collins Jr.), who are deep in conversation. He explains to Lawrence why Westworld exists: “They wanted a place hidden from God, a place they could sin in peace.” Except there’s more. “But we were watching that. We were tallying up all their sins, all their choices. Of course, judgment wasn’t the point. We had something else in mind entirely.” He tells Lawrence he plans to escape the park and then burn it down. But to do that, they’ll need help, so Lawrence leads him to Pariah, the town of decadence and depravity from Season 1. But Pariah appears to have been decimated. The ground is littered with bodies, and mice skitter through an abandoned banquet. Suddenly a group of figures arises from among the bodies, encircling the Man in Black and Lawrence, their guns drawn. Seated before them is none other than El Lazo—the outlaw leader who, in earlier episodes, had been Lawrence himself and is now played by a different host. The Man in Black grabs him and points a gun to his head, demanding that the gathered gang of outlaws join his cause. “This game was meant for you, but you must play it alone,” El Lazo says. Suddenly the bandits all turn their guns on their own heads and collapse in a heap. El Lazo grabs the trigger of the Man in Black’s gun and shoots himself. The Man in Black curses but pulls himself together. “I built this place we’re going, and it’s my greatest mistake,” he tells Lawrence. The episode jumps to Dolores, who is seated in a host examination room. “Bring yourself back online, Dolores,” says a voice. This time it’s William. It’s the first time we’ve seen him in the lab facilities of the park. He marvels at how ridiculous it was for him to fall in love with her, a mere thing. “You don’t make me interested in you, you make me interested in me,” he tells her. He adds that everyone loves staring at their own reflection. Then he says cryptically, “I think there’s an answer to a question no one has ever dreamed of asking. Do you want to see?” In the next scene, William and Dolores are out in the wilderness, looking down at a canyon getting carved out by bulldozers. If the Man in Black and Dolores are headed to the same place, this giant pit—or rather, whatever it becomes—seems like it will be the stage for an epic showdown. The role this place, this weapon, as Dolores calls it, will play in determining the park’s fate is a tantalizing question. Yet the shattering of the illusion that Westworld is the center of action is the true legacy of this episode. The hosts have visited our cities. Perhaps some of them wander among us. What defines the park, and what is the outside world? The answer is no longer clear.